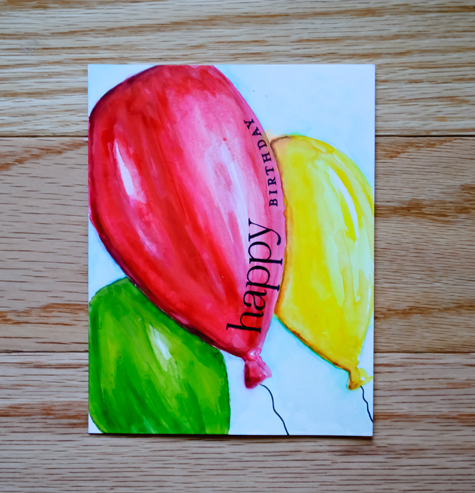 DEAR PAPERLICIOUS: Muse Challenge #122: Balloons! No need to be frustrated... this is a great card! I love the bold colors! I like it! Especially the sentiment on the red balloon. Does not seem off to me. Beautiful! Everything's just perfect in the card! Oh I know the feeling Joan! Been there! BUT... in the end your card is beautiful, bold and fabulous. I love it! I love the look you achieve with your watercolouring - it's unique and provides a lot of dimension! So glad you joined us this week at Muse Joan! Sorry for the frustration (I can relate), but your final product is wonderful! I love your card. I think you are too hard on yourself! Your watercoloring is really nice. Don't stop. Hahahaha! One must really read to the end. Yes, you are a true artist, angst and all. I know this is not simple, and it is very creative. Love how you placed the sentiment. Actually, I absolutely love everything about it!